What is Solfege? This is not an easy question to answer without a personal demonstration, but I'll try. I'm no expert, but I have taught a few children's classes in shape-note singing, and I get bonus points because my parents met at a week-long summer solfege singing school. 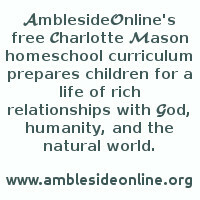 <G> I was pleasantly surprised some years ago to find, while reading the series, that Charlotte Mason advocated it. It's a wonderful thing to know. In short, solfege or sol-fa can mean one of two things, or a combination of both . . . It can refer to singing, usually acapella, by reading music that uses "shape notes" (rather than the usual oval notes) and where each note of the scale has its own name: do-re-mi-fa-sol-la-ti-do. It can also refer to using hand-signals for each note of the scale (using those same names). Either way, it's a method of giving the singer a visual cue for which note to sing . . . one way, each note of the scale has its own shape on the staff, and the other way, each note of the scale has its own hand signal. Hand signals are similar. When the song leader gives the hand signal for "do" you sing the word "do" on the correct tone for "do" . . . and so on. Yes, you have to think fast! Charlotte Mason refers to the Curwens in a passage on music in the series. John Spencer Curwen developed the hand signals for tonic sol-fa, based on earlier work by a woman named Glover. His son carried on his work, expanding the method into widespread use in schools all over England, and he developed the family musical interests into a large music publishing business. This was during Charlotte Mason's lifetime. This son was married to Annie Curwen, a piano teacher whom CM mentions by name. Charlotte Mason implemented solfa training at the PNEU schools, apparently using the Curwen method. Nowadays, the hand signal method of solfege is more strongly associated with Kodaly (pronounced "ko-dye") than with the Curwens. When Charlotte Mason refers to "tonic sol-fa" (Vol 1, p. 314) she seems to be referring to the hand signals. However, it is my understanding that shape-note hymnals were much more common in her day, so I suspect that a useable knowledge of shape notes was also a more common skill then than now. You could also do an internet search for the Kodaly instruction method -- I know there are sites out there but I don't have any bookmarked. Perhaps others on the list can give you pointers for teaching children music when your own skills are rusty. There are some notes on our website that may help you as well -- look on the Composer study page for links.